As we’re sure many of you are aware, SREC values have really taken a nose dive in the State of Maryland this past year. It’s been a major bummer for us and we know that it’s been hitting our current customers hard. While we speculate that the market is depressed for several reasons, we do expect the market to reinvigorate this winter. 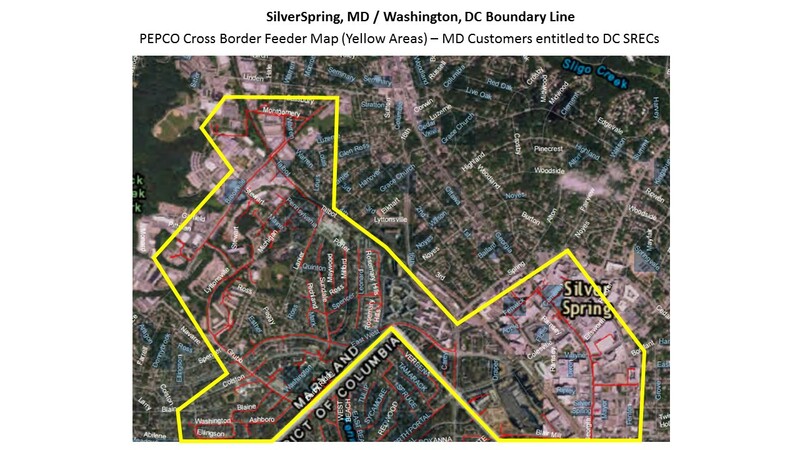 Additionally, there is some good news for some solar customers in Maryland who live close enough to DC to enable them to sell their SRECs in the DC marketplace. Knowing how bad the market is right now in Maryland, we are eager to share this tip and to impart our knowledge on the situation. 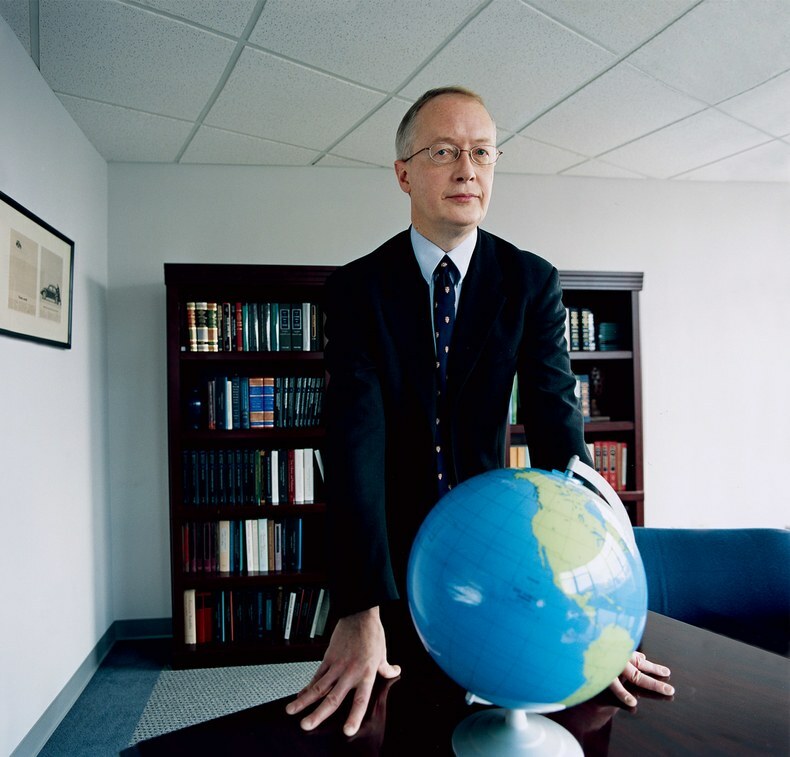 See blog post on Flett Exchange for more info with regard to SRECs here in Maryland. Why Has The Market for SRECs Dropped In Maryland? Many people in the industry, ourselves included, have theorized that the market has been depressed for two reasons: low demand combined with high supply. In the first instance, there was an urgency to go solar in 2015, especially late 2015/early 2016, as the Federal Residential Renewable Energy Tax Credit was set to expire in December 2016. In fact, PV solar has been so popular in Maryland that 124 megawatts of PV solar was installed in 2015, double to the amount installed in 2014! While this amount of deployed solar has been great for the environment and is propelling little Maryland towards the head of the pack in efforts to combat greenhouse gas production nationally, it has depressed our market by flooding the market with more supply than is demanded. That brings us to our next topic: demand. In Maryland, it is the Renewable Energy Portfolio Standards put forth and set into law by the Maryland General Assembly that drives the SREC market. The RPS dictates how much of our consumer market electricity must be generated from renewable sources. 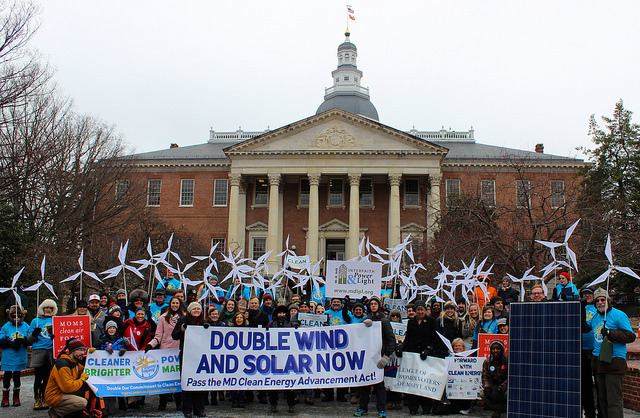 If a Maryland utility is unable to generate their own renewable energy, either via wind or solar, they can either pay a stiff fine or they can buy SRECs from residents and businesses that have privately invested in solar and are generating clean energy. 2016 has been what is referred to as a “compliance year.” A year in which utilities were well situated to meet their legislated goals and did not have a high demand for SRECs. In combination with an over-abundance of SRECs, the low demand has meant a depression in the market and falling prices. Essentially, the current RPS has been unable to keep up with the popularity of solar here in Maryland. As we reported in an earlier piece, the General Assembly in Maryland is well aware of the situation and are taking steps to stem the tide of bad SREC tidings. During the last few days of the last session, members passed revisions to the Renewable Energy Portfolio Standards contained within the Clean Energy Bill that aimed to strengthen and escalate the deployment of renewables. Unfortunately, the Governor Larry Hogan declined to sign it into law. While this an unfortunate turn of events, especially considering his prior approval of the more stringent 2016 Greenhouse Gas Reduction Bill, the Clean Energy Bill was passed by a veto-proof majority and is expected to be passed in the new year when the General Assembly reconvenes. The bill is thought to drive the demand for SRECs back up. 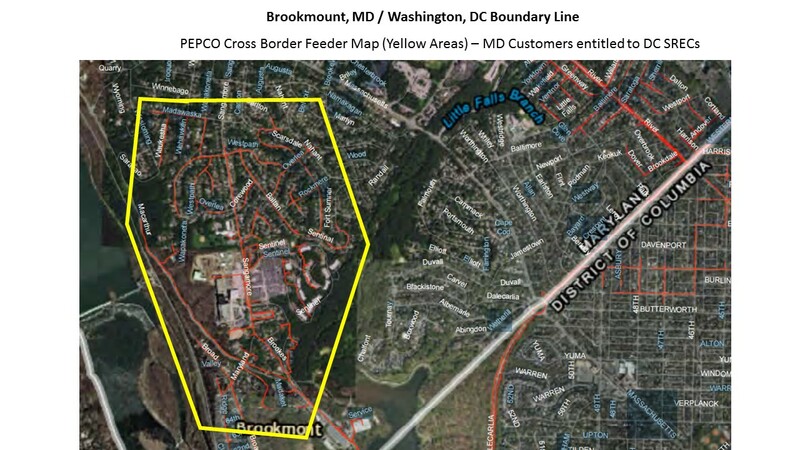 According to PEPCO, “in some parts of our service territory, electricity feeders may be located in Maryland, but serve residential or commercial customers in the District of Columbia. When behind-the-meter solar or other renewable energy generators are located on those feeders in Maryland, the customer is eligible for Solar Renewable Energy Credits in the District.” This may be a boon so to some Marylanders. Currently, Washington DC SRECs are selling for $480, per SREC. 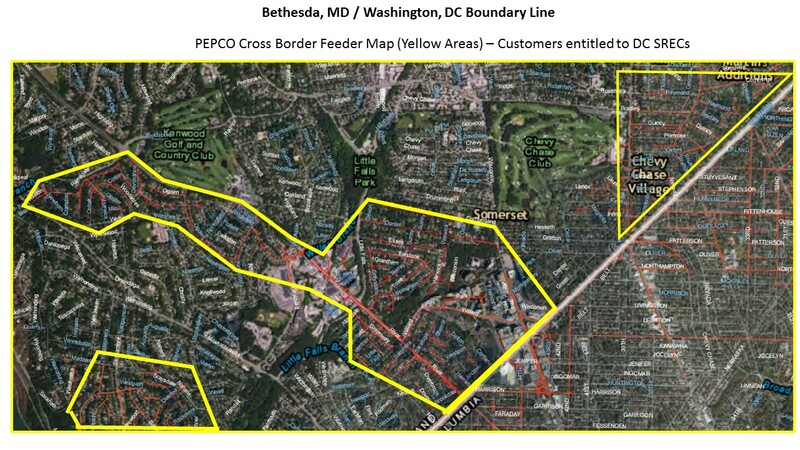 Check the maps below to see if you’re located on a PEPCO DC feeder line. As you may be aware, the Chesapeake Bay was once an abundant waterway, home to a teeming population of blue crabs, oysters, rockfish and impressive forests of sea grass. Because Maryland borders the Chesapeake Bay we are on intimate terms with the world’s largest estuary and have known for many decades that our beloved bay is in trouble. 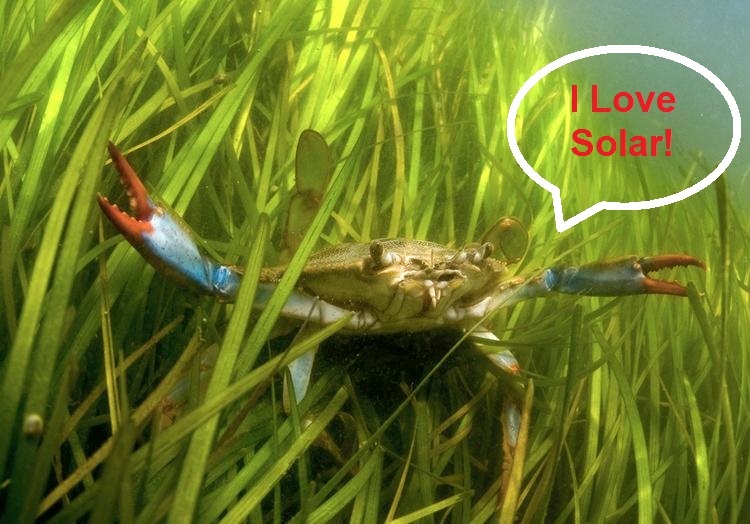 According to the Chesapeake Bay Foundation, sea grass coverage continues to hover at around 20% of historical levels, while blue crab populations have dwindled to 50% of their population levels recorded during the 1980’s. Rockfish continue to struggle to regain a foothold in the Bay and the oyster population is now 98% below historical numbers. In fact, it would take the Bay’s current population over a year to filter the Bays’ waters; at prior population levels it would have taken only a few days! Due to a combination of nitrogen pollution, habitat loss and over fishing, the health of the Bay is in crisis. At a loss of $4 billion during the last 30 years for both water men and the Chesapeake Bay seafood industry, it is indeed a precarious situation for the world’s largest estuary. 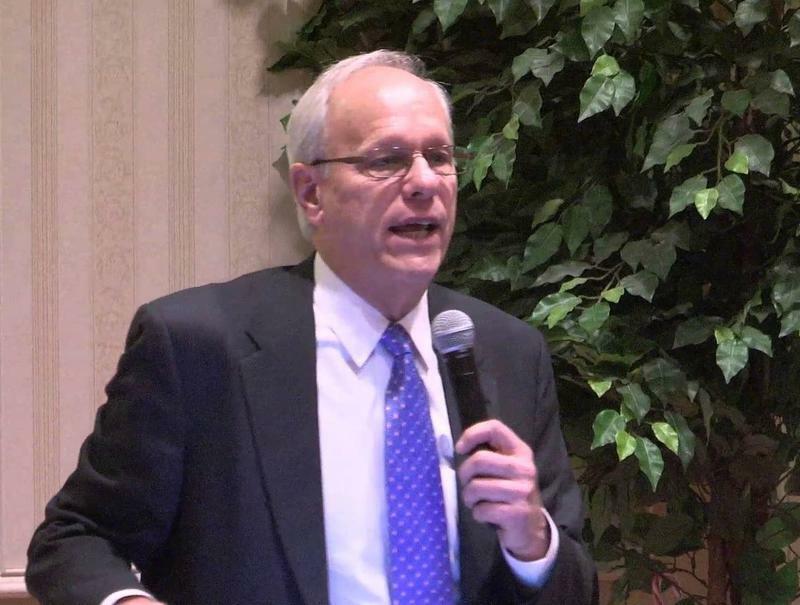 According to a Bay health scorecard recently released by the University of Maryland, there seems to be a turnaround underway. The blue crab population has gone up, the oyster harvests have increased, amounts of dissolved oxygen in the Bay went up and aquatic grasses have increased by 50% from 2011 to 2015. While there has not been meaningful movement made by either Virginia or Maryland on decreasing the amount of nitrogen pollution generated by poultry farms on the Eastern Shore (in fact, it is has gotten worse), the overall amount of nitrogen has decreased and with it the choking blooms of algae associated. Why? Well, believe it or not there is a connection between the health of the Chesapeake Bay and solar power! More precisely, energy that displaces coal-fired electricity and the the high levels of air pollution associated with it. In fact, about a ¼ of the nitrogen pollution entering the Bay is from the air! Beginning with the 2006 Maryland Healthy Air Act and then the 2009 Obama Administration regulations imposed on coal-fired power plants we have seen a major reduction in air born nitrogen polluting the Bay. We can’t help but think that the 349 MW of solar energy currently installed in Maryland may have also had a part to play in such good news! After all, we rank #13 in the United States in installed solar capacity! Because of the cleaner energy choices we make, our Chesapeake’s water becomes cleaner and clearer too! 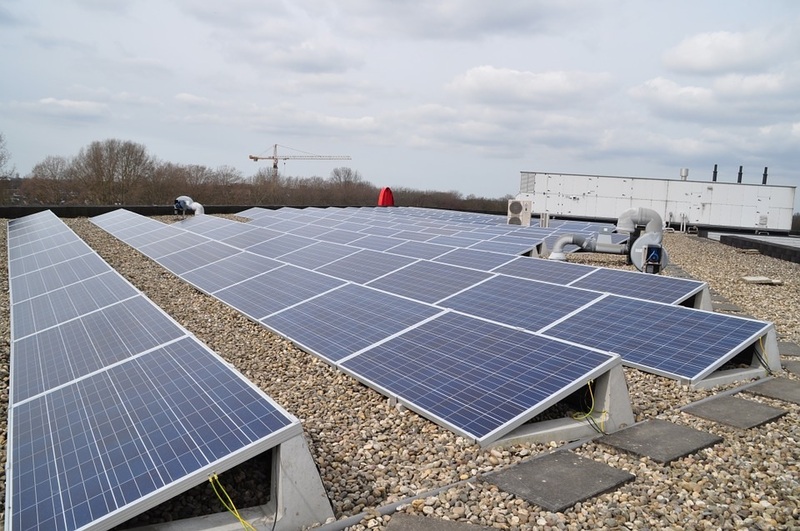 PACE Funding Now Available in Maryland for Commercial Solar Projects! Picture taken from a Solar PV Array MSSI installed in Chestertown, Maryland. We are pleased to announce the emergence of Property Assessed Clean Energy (PACE) funding for Commercial Solar Projects here in Maryland. Currently only available in Montgomery, Howard, Anne Arundel and Queen Anne’s Counties, PACE-funding opportunities are expected to spread into neighboring counties within the next few years here in Maryland. As stated above, PACE stands for Property Assessed Clean Energy, and is a policy that gives business owners an affordable way to mitigate the high upfront costs associated with larger-scale commercial clean energy projects by attaching the amortization of a loan to your yearly property tax payments. Huh? Here’s the nuts and bolts: in partnership with the State of Maryland, Greenworks Lending provides loans to commercial businesses wishing to invest in clean energy and/or efficiency upgrades. The loan is then paid back through your property taxes over the course of 20 years. The loan is added as a lien to your property taxes for the life of the loan. It does not raise your property taxes by assessing the added value of the solar, but simply adds the loan payments to your yearly property taxes. In order to apply for PACE funding the borrower in question must be the private owner (i.e. not the government) of the property. The borrower cannot have gone through bankruptcy. The loan amount can be up to 20-30% of assessed value of the building and land of the property. What’s So Great About PACE? PACE makes is super-easy to take out a loan, and it gives businesses first-year cash flow. How? In the first place, PACE allows businesses to lower their overhead immediately by either eliminating or significantly reducing their utility bills. Additionally, with PACE the business owner is able to utilize the Federal 30% Tax Credit, any local incentives, Net Metering, the Maryland Energy Administration Grant, MACRS and the production of SRECs. Through PACE, Greenworks Lending offers “sculpted ammortization” which means that the bulk of your loan will be paid back within the first 6 years of the array having been installed. For instance, if a borrower takes out $100,000 in PACE financing, during the first year, the borrower would receive $30,000 back from the Federal government on top of being able to depreciate 50% using MACRS. After taxes the borrower will get back an additional $50,000 for having invested in solar. 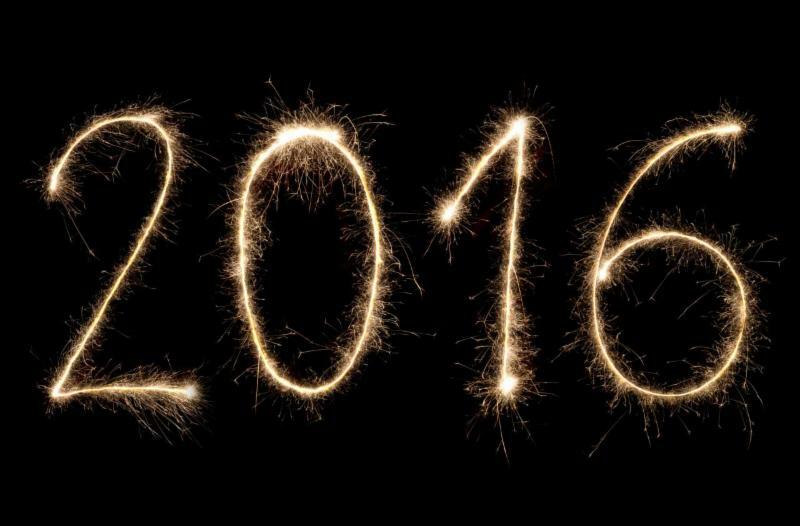 During the first year, the business will pay back a larger portion of their loan. Because of the incentives coming back to the borrower within the first 5-years, the loan payments at the beginning are higher and allow the borrower to virtually pay back the bulk of the loan within the first 6-years. This makes the remaining payments on the loan super-affordable. Pretty awesome! 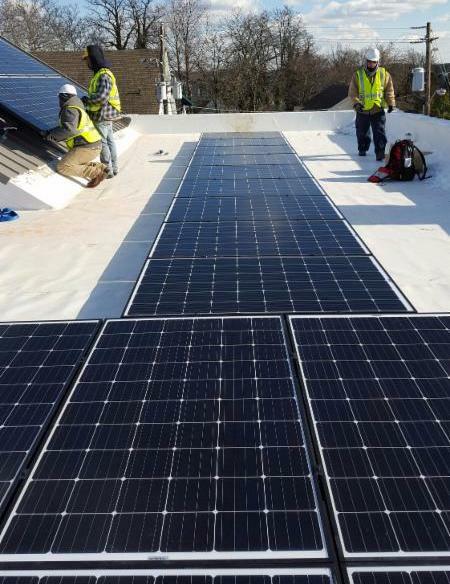 Picture taken from a Solar PV Array MSSI installed in Randallstown, Maryland. 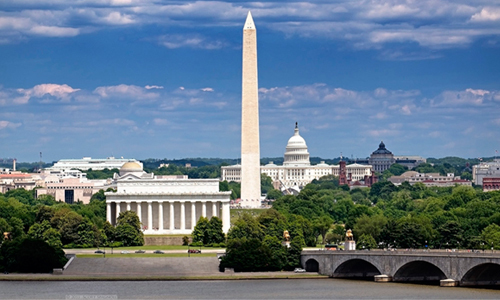 Here at MSSI we’re proud to be a registered PACE Contractor for the State Of Maryland. We can help you look at solar for your business and whether PACE will work for you. PACE really creates an affordable alternative to leasing and power purchase agreements and allow businesses to leverage solar power as an investment and create tax-free value for their properties. Really, its a win-win. Posted in Environment, News, Solar in Maryland, Solar Incentives, Solar Legislation	| Comments Off on PACE Funding Now Available in Maryland for Commercial Solar Projects!